Traditionally, a working boat carries out the services of a port, a harbour, a dockyard. The Aero-Naut Torben is a close to life reproduction of a tug boat. The lifeboats are specially designed for rescue at sea. 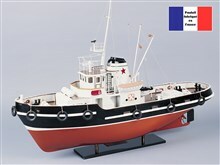 New CAP Maquettes manufactures the model boat kit of the VSM 063. The oceanographic ship Calypso is a complete construction kit with ABS plastic hull. By extension, passenger and haulage ships are working boats. Discover La Jocelyne, 300 Tonne Barge, manufactured by New CAP Maquettes.